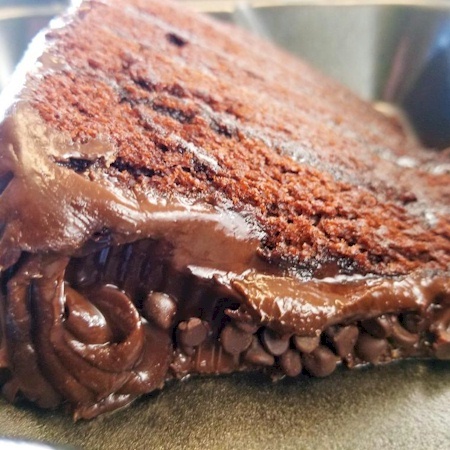 Mel's is a locally-owned and operated diner known for serving large portions of freshly-prepared traditional American fare including handcrafted burgers and fries, sandwiches, soups, salads, and dinner entrees featuring pasta, seafood, chops, steaks and more. 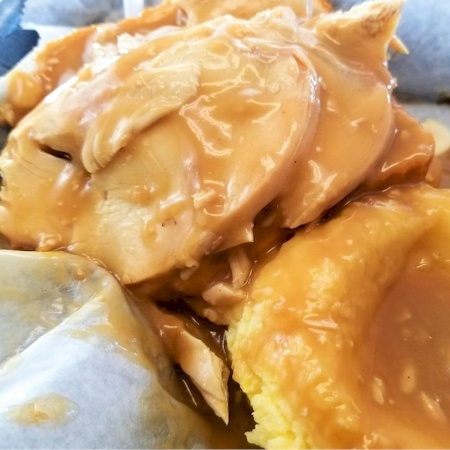 Cooked on premises, oven-roasted turkey, Granny Apple stuffing, turkey gravy and cranberry sauce. 22180. Prime Rib Dinner - 1/2 lb. USDA choice Prime Rib, slowly roasted with 17 spice blend. Served with baked potato and Caesar salad. Roasted turkey and Apple-Wood smoked bacon on toasted artisan bread with mayo. Served with Mel’s mild, medium, hot sauce. Served with ranch or blue cheese dressing and celery. A full slab served with natural cut Idaho french fries and Mel’s coleslaw. Includes choice of soup or salad. Served with Mel’s mashed potatoes. Includes choice of soup or salad. We use cholesterol free and 0% trans fat soy bean oil. With Mel’s Chili & Cheddar Cheese. Served with cayenne pepper sauce. Pepper jack cheese, shredded cheddar, grilled chicken, Apple-Wood smoked bacon, tomatoes and scallions in a sun dried tomato tortilla. Fresh mozzarella, vine ripe tomatoes, roasted red peppers, sweet red onions, served with roasted Italian ciabatta with pesto and raspberry balsamic drizzle. Mel’s tangy BBQ chicken, red onions, and mozzarella. Crisp salad greens, grilled shrimp, craisins, candied pecans, mandarin oranges, blue cheese crumbles and cucumbers tossed in our honey bacon vinaigrette. Crisp salad greens, Mel's catch of the day (broiled, blackened, or sautéed), craisins, candied pecans, mandarin oranges, blue cheese crumbles and cucumbers tossed in our honey bacon vinaigrette. Fresh roasted turkey, chopped tomatoes, cucumbers, Apple-Wood smoked bacon, red onions, blue cheese crumbles, chopped eggs and avocado with your choice of dressing. 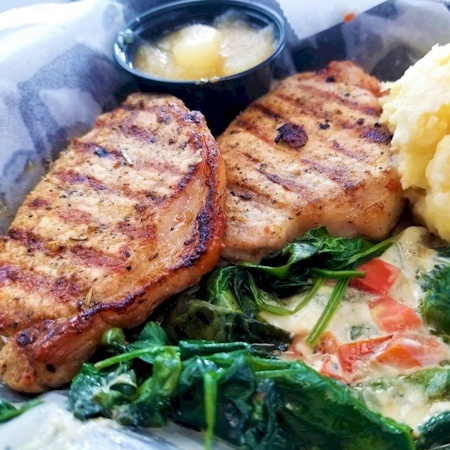 For an additional charge add grilled chicken, grilled shrimp, Mel's catch of the day (blackened or sautéed), or salmon. Seared chicken breast, cucumbers, scallions, almonds, mandarin oranges and rice noodles with our signature ginger dressing. Add salmon for an additional charge. Grilled salmon, cucumbers, scallions, almonds, mandarin oranges and rice noodles with our signature ginger dressing. Add salmon for an additional charge. 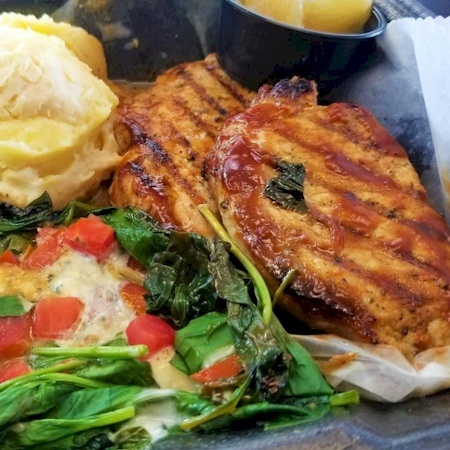 Served with fresh spinach, feta cheese, tomato and grilled natural chicken breast. Substitute salmon for an additional charge. Served with grilled natural chicken breast, craisins, candied pecans, mandarin oranges, blue cheese crumbles and cucumbers in honey vinaigrette. Substitute salmon for an additional charge. Spaghetti, topped with Mel’s Homemade Chili, cheddar cheese, onions and a side of sour cream. ½ pound Braveheart Black Angus burger served with Mel’s coleslaw. For an additional charge add natural-cut French Fries, Wets, Cheese Fries, Sweet Potato Fries, Onion Rings, or Rings and Fries. Our juicy 1/2 lb. Black Angus burger rolled in blackened seasoning, grilled to your liking, topped with crispy bacon & melted blue cheese crumbles. Fire it up with Jalapenos for an additional charge. 12 oz. burger with grilled onions and tomatoes, Apple-Wood smoked bacon and topped with American cheese. Served on a toasted garlic hoagie. Served with French fries, Mel’s coleslaw and kosher pickle. Topped with cheddar cheese and onions. Served with French fries, Mel’s coleslaw and kosher pickle. Turkey, ham, vine-ripened tomatoes and Apple-Wood smoked bacon on Texas toast topped with our signature cheese sauce. Served with French fries, Mel’s coleslaw and kosher pickle. 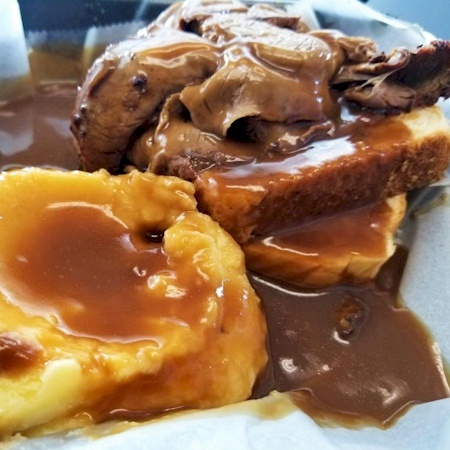 Served with Mel’s mashed potatoes and homemade gravy on Texas toast. Antibiotic free, 100% vegetarian fed, no added hormones and no preservatives. Served with French fries, Mel’s coleslaw and a kosher pickle. Topped with apple wood smoked bacon and cheddar cheese, served on a kaiser roll. Fire grilled chicken breast, mixed greens, ranch dressing wrapped in a sun dried tomato tortilla. Fire grilled chicken breast, romaine, Caesar dressing in a sun dried tomato tortilla. Served with French fries, Mel’s coleslaw and kosher pickle. Made fresh daily with leaf lettuce and seasoned vine-ripened tomatoes. Served on a toasted thick white artisan bread with lemon basil aioli, crisp Apple-Wood bacon, tender lettuce and fried green tomatoes. Better Bacon Lettuce Tomato. Substitute tomato with fried green tomato for an additional charge. American, Swiss, provolone cheeses, tomatoes, and Apple-Wood smoked bacon on grilled thick artisan bread. Fried boneless chicken tossed in our medium buffalo sauce and served with Mel’s blue cheese on a toasted garlic hoagie. 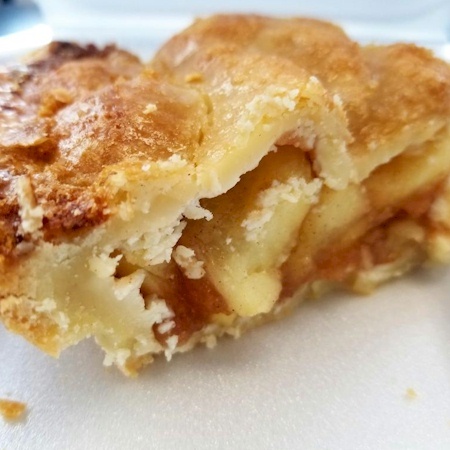 Served with salad and choice of Mel’s mashed potatoes, Sun Coast rice pilaf, natural cut Idaho French Fries, seasonal vegetables, baked potato, baked sweet potato, or for an additional charge sweet potato fries. A traditional favorite lightly dusted and pan-fried with crisp apple-wood smoked bacon and grilled onions. 22181. Prime Rib Dinner - 14 oz. 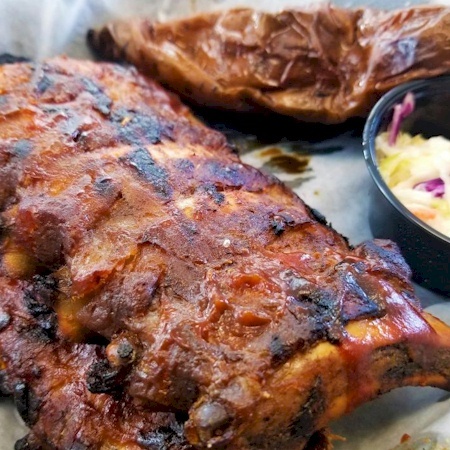 A full slab of Mel's award winning ribs, served with natural idaho fries and Mel's coleslaw. Served with soup or salad. 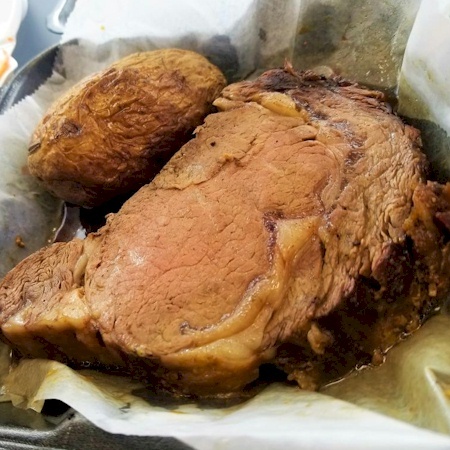 Steaks served with choice of Mel’s mashed potatoes, Sun Coast rice pilaf, natural cut Idaho French Fries, baked potato or sweet baked potato. Served with Mel’s fresh steamed baby spinach and blue cheese mix, and topped with sautéed mushrooms. 12 oz. strip steak, dry rubbed with Mel’s 17 herbs and spices (secret rub) and topped with sautéed mushrooms, served with Mel’s fresh steamed spinach and blue cheese mix. Grilled boneless center cut chops. Served with Mel’s fresh steamed spinach and blue cheese mix. Served with Mel’s fresh steamed spinach and blue cheese mix. USDA Choice Filet mignon and 4 oz. Maine lobster tail served with choice of potato & our homemade chicken soup. Grilled Chicken Glazed with Carrot Ginger Miso Sauce Infused with Cigar City Maduro Brown Ale. Served with fresh steamed spinach and rice. Topped with goat cheese, Mel’s Key Lime sauce, and sun-dried tomatoes. Served with Mel’s fresh steamed spinach and blue cheese mix. Avocado, tomatoes, and jack cheese topped with jalapeño ranch dressing. Served with Mel’s fresh steamed spinach and blue cheese mix. Served with soup or salad. 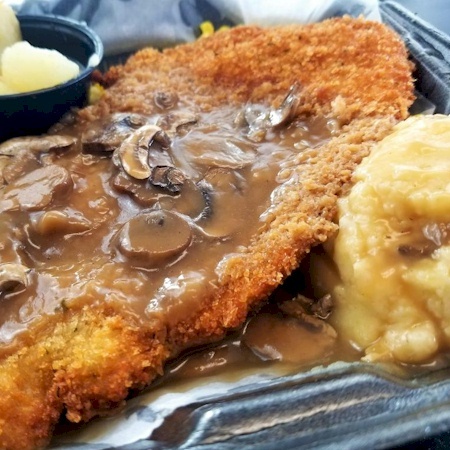 Mel's Catch dinners include choice of Mel’s mashed potatoes, Sun Coast rice pilaf, natural cut Idaho French Fries, baked potato or sweet baked potato and steamed vegetables. Sautéed filet topped with mushrooms & chopped tomatoes, finished with our key lime hollandaise sauce. Mild white flaky filet of fish, available blackened, sautéed or crunchy (fried). 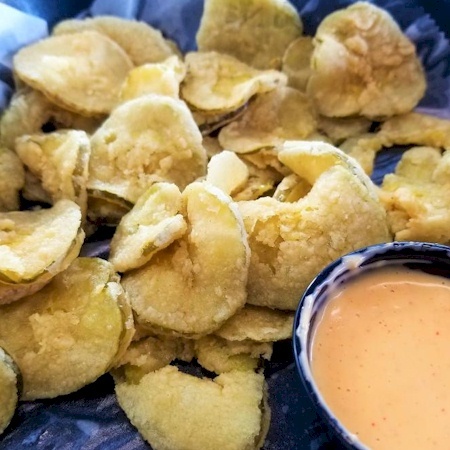 Dusted in pistachio flour, sautéed golden brown, and topped with our key lime sauce. Lightly seasoned & quickly grilled, tossed with fresh diced tomato, hearts of palm and cilantro, topped with key lime sauce. 1/2 pound of grilled or fried shrimp, served with rice, choice of potato, coleslaw and soup or house salad. Served with Mel’s fresh steamed spinach and blue cheese mix, rice and soup or salad. Salmon glazed with garlic ginger soy BBQ sauce infused with Cigar City Maduro Ale. Served over steamed fresh spinach and blue cheese mix with rice, and choice of soup or salad. 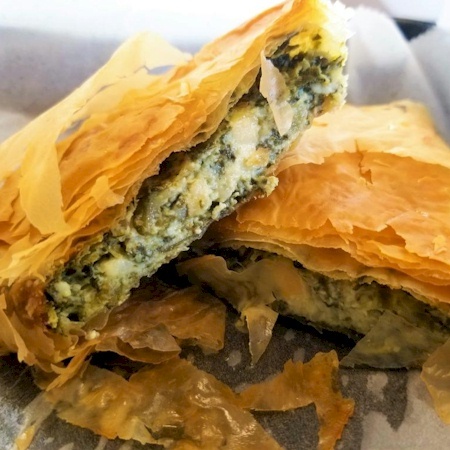 Served over steamed fresh spinach and blue cheese mix with rice, and choice of soup or salad. Lightly seasoned & topped with fresh diced tomatoes, hearts of palm, cilantro and key lime sauce. Served with crisp garlic bread and choice of soup or salad. Fried boneless chicken topped with melted provolone and parmesan cheeses, served with homemade marinara over linguini. Penne pasta, grilled chicken, chopped Apple-Wood smoked bacon, tomatoes, scallions and shredded parmesan cheese. Herb marinated grilled chicken, sun dried tomatoes tossed in a light pesto cream sauce with penne pasta. Spaghetti, topped with Mel’ s homemade chili, cheddar cheese, onions and a side of sour cream. Seasonal selection burger flavored with our house 17 spice & herb seasoning on a wheat bread served with mixed salad and low calorie raspberry vinaigrette. Served with potato pancakes, homemade biscuits, and fresh fruit. Mushrooms, green peppers, onions, spinach, chopped tomatoes and goat cheese. Served with spicy jack, cheddar and Swiss cheeses. Crumbled feta, chopped tomatoes, onions, kalamata olives, fresh baby spinach. Pepper jack, shredded cheddar, chopped tomatoes, salsa, jalapeños, sliced green onions and grilled chicken. Choose from Coke, Diet Coke, Decaffeinated Diet Coke, Sprite, Fanta Orange, Root Beer or Minute Maid Lemonade. A slice serves up to 4 people.